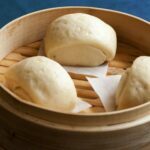 Mantou – Steamed Buns. 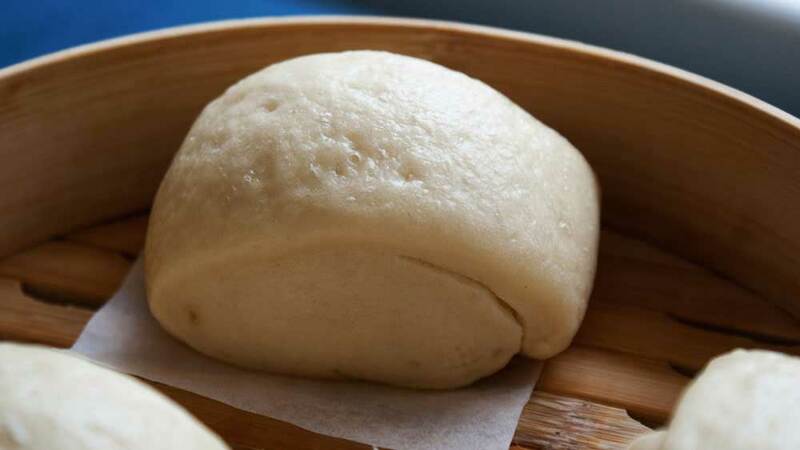 These steamed soft and fluffy buns are perfect with noodle soups or any Chinese dish. I love bread, bread makes so many things better. Bacon – yum. Bacon sandwich – double yum! Cheese – yum. Cheese on toast – double yum! So when I was first introduced to Chinese bread products, in the form of Char Siu Bau (Chinese Barbecued Pork Steamed Buns) I was hooked. Soft steamed bread filled with the most amazing sweet, salty pork. Oh….are you drooling? After that I started exploring all of the steamed buns and bread based dumpling options. I think I could eat something from that category every day! Since I first shared these back in April 2015 they have been a solid post on my blog. They are a dish we eat so often! So I have pulled them to the front to give you another chance at these fluffy steamed balls of bread perfection! 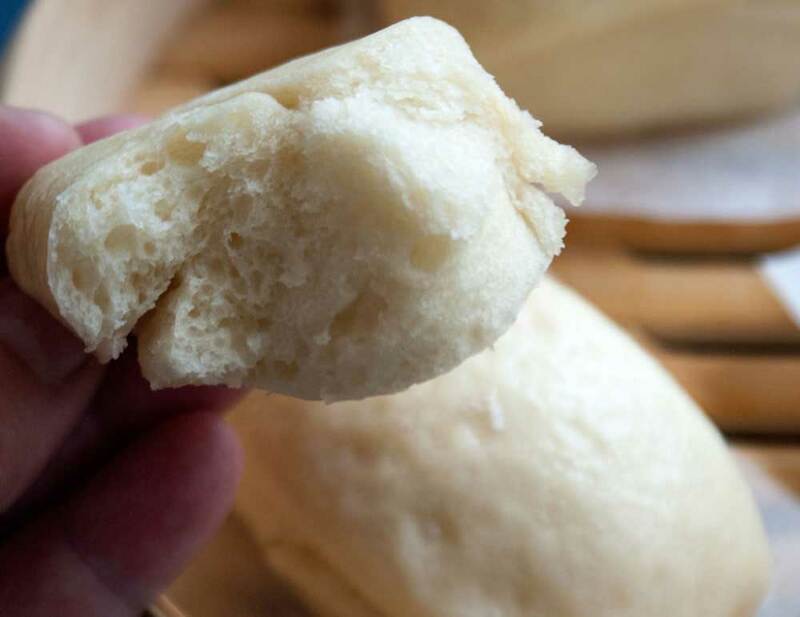 Today I want to share my recipe for Mantou, which are the plain steamed buns. After a bit of research I have found that these are often eaten for breakfast in China as well as served with any saucy dish. Especially congee. Oh I love congee! I might have to make that for the blog soon. My recipe for congee is on the blog now, get it here. Anyway back to these pillows of fluffy perfection. They are soft and so moorish! We never have leftovers! The boys enjoy them as a snack with barbecue sauce, or if I am feeling generous chocolate spread! They also dip them into noodle soups, sweet and sour chicken, beef and broccoli. The list goes on and on. They love them! We all do. Last night we had them with crispy Szechwan belly pork and stir-fry veg with oyster sauce. But you can serve them with any Chinese dish. Or just eat them with butter for breakfast. Don’t let the fact these use yeast put you off, they are pretty simple and if you have a stand or electric mixer they are pretty effortless. Even kneading by hand doesn’t take too much work, the dough is quite sticky so don’t worry if you find it is sticking to your fingers a bit. Mantou - Steamed Buns. 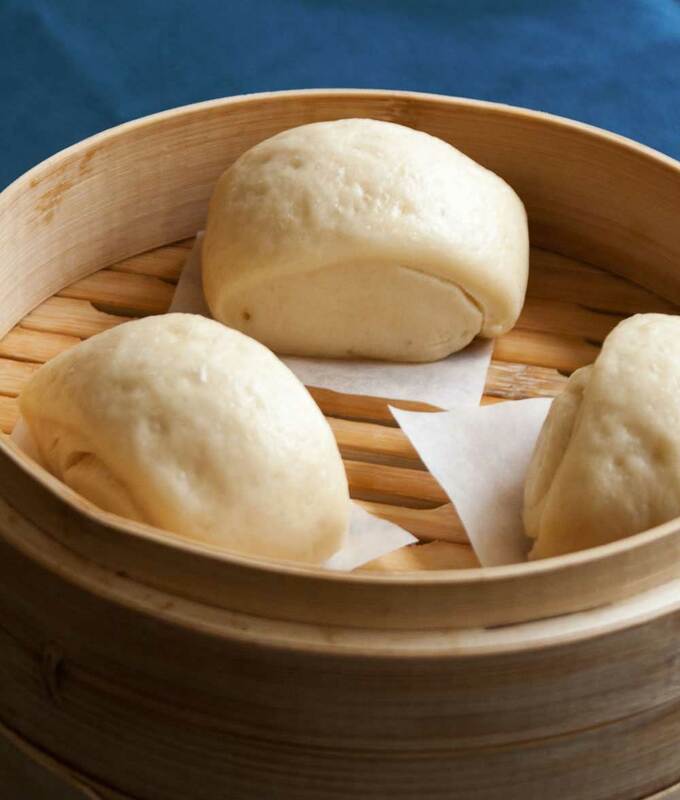 These steamed soft and fluffy buns are perfect with noodle soups or any Chinese dish. Place the yeast, flour and sugar into the bowl of a stand mixer, fitted with a dough hook. Gently mix for a minute until everything is well combined. Pour in the oil and water. Then mix on a slow setting until a sticky looking dough has formed. Turn the speed up to medium and knead the dough until it is smooth. This takes 10-15 minutes. The may still be slightly sticky, but that is okay. Leave the dough sit for 5 minutes. Oil your hands and remove the dough from the bowl. Fold the dough rectangle into thirds to create a square. Roll it out again to roughly a 50 cm x 25 cm rectangle. Use a pastry brush (or your fingers) to lightly brush the surface with water. Use a sharp non-serrated knife to slice the log into 16 pieces. I tend to do this by cutting the log in half, then cutting each half in half and so on until I have 16 equal sized rolls. Cut 16 small squares out of cooking paper and place a bun on each square. Place the buns into your steamer baskets. If your steamer is quite small, place half the buns in the steamer and leave the other half under a tea towel. Allow the buns to rise for a further 20 minutes. Then add boiling water to your steamer and cook the buns for 15-20 minutes until puffed up and cooked through. If you love this recipe why not sign up for my FREE newsletter, packed with recipes, tips and tricks. To be honest they don’t keep that well, they go slightly hard and chewy if left for more than 12 hours. We very rarely have left overs but when we do they will keep until the following morning. I then steam them to heat them through and soften them slightly. They aren’t as good as when freshly cooked but my boys smoother them in jam for breakfast. Microwaving them doesn’t give great results, they tend to toughen up. I have made the dough and then frozen half for another time. This seems to work quite well, but freezing the cooked buns has never given me good results, they end up overly chewy and dense. I was looking for a baking project for the weekend and these fit the bill perfectly, except that the baking has become steaming. I’ll adapt. They look terrific! Thank you Paul, I hope you enjoy them. They are definitely a favourite in our house. Checking back in, Claire. I made these and they stole the show. Fabulously easy and kinda magical – baking with steam. Thank you for sharing! I can vouch for the fact that these buns are excellent!! !